Steam broccoli broccoli for 5-6 minutes until just tender. 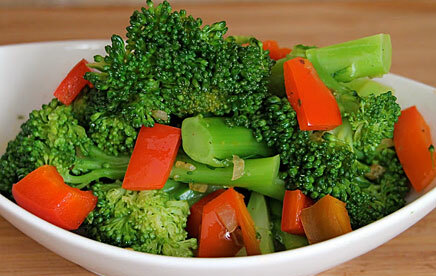 Remove broccoli and place in bowl filled with ice water to retain bright green color, drain. Heat olive oil in a saute pan and add shallots. Stir and cook until translucent, about 1-2 minutes. Add red capsicum and saute 1 minute. Add cooked broccoli and toss until heated through.